-At the lateral gates - pace and rack - the horse's back remains level, making for a more comfortable ride without having to post. Pacers were earlier known as amblers, and are known throughout the world as early as the 4th century b.c. -In Maryland, the horse industry is the largest agricultural industry. -On the island of Hydra in Greece, motorized vehicles are prohibited and all horse-power comes from horses & ponies. -At John F. Kennedy's funeral - November 25th, 1963 - the riderless horse was named Black Jack. The boots reversed in the stirrups indicated a fallen leader who would ride no more, a tradition tracing back to the ancient Mongols. 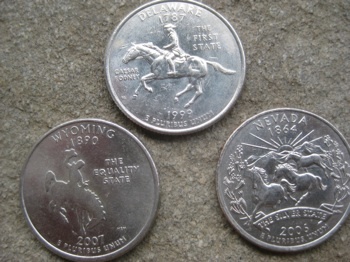 USA Quaters from Delaware, Wyoming and Nevada. -In many countries horse have been depicted on the coins, particularly in the ancient world. Race horses, war horses and chariot horses have al been shown, as well as mythological horses and heroes, rulers, gods, and goddesses. 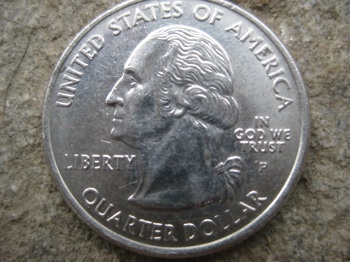 -Many of the horses shown on coins are the horse that is now called the Arabian. -Research has shown that horses are more secure and comfortable when trailering if they can face the rear of the trailer. -There is a bone in the human inner ear that is called the stirrup. -The forward seat, which is the basis of modern English riding, was developed by Frederico Caprilli of Italy. -Manhole covers were originally designed with raised covers to keep horses from slipping. -The French cavalry school at Saumur was founded in the reign of Louis XV. -Major Harry D. Chamberlain, who helped introduce the forward seat to American riders (military and civilian), was a graduate of the U.S. Military Academy (mounted Service School), the French cavalry school at Saumur, and the Italian Cavalry School at Pinerlo.